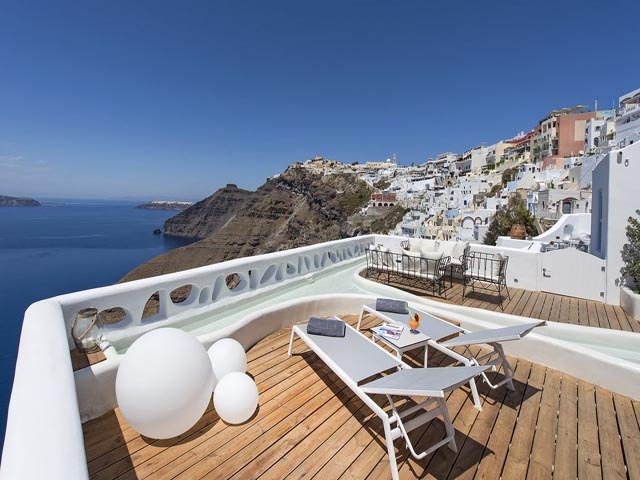 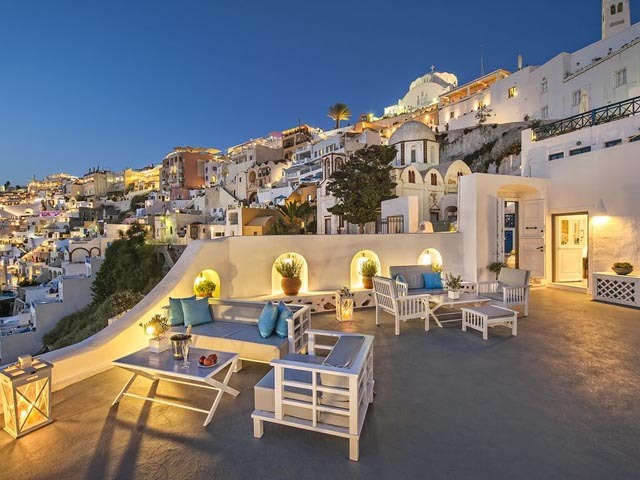 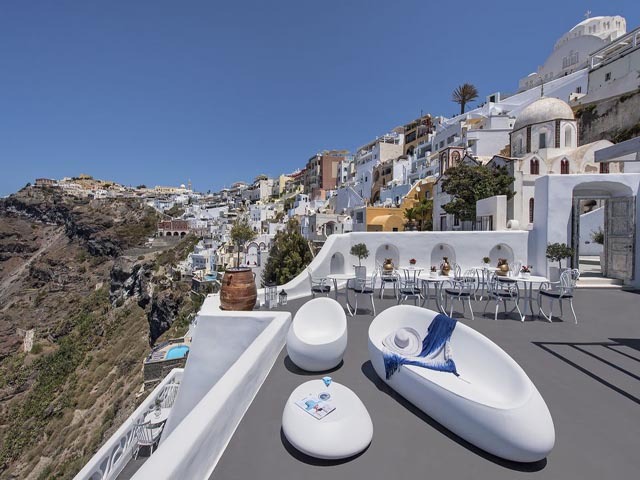 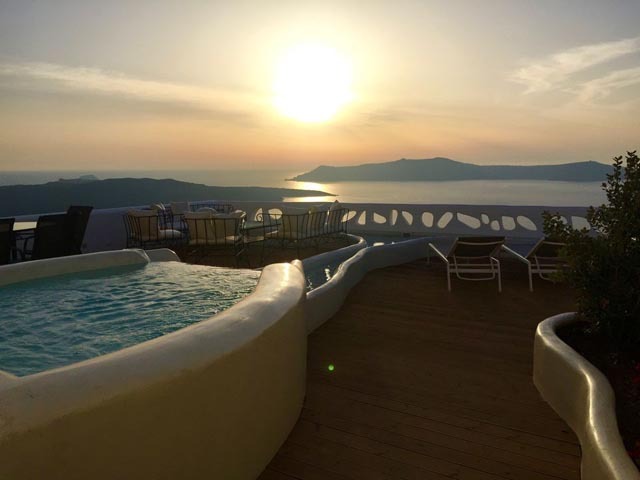 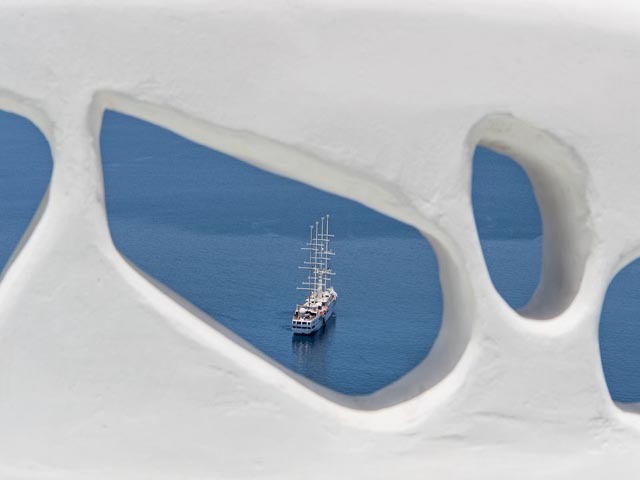 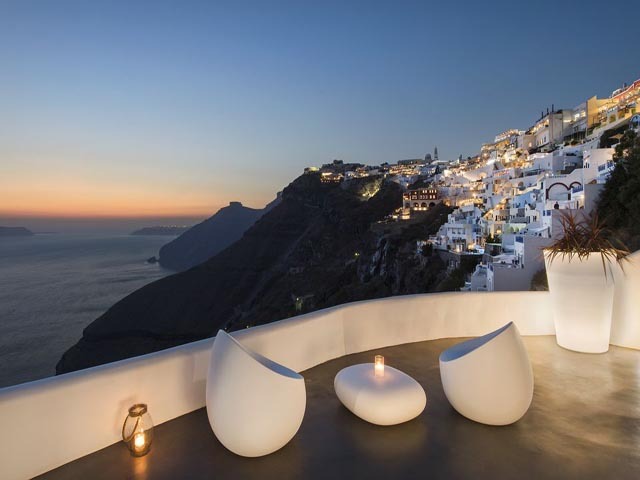 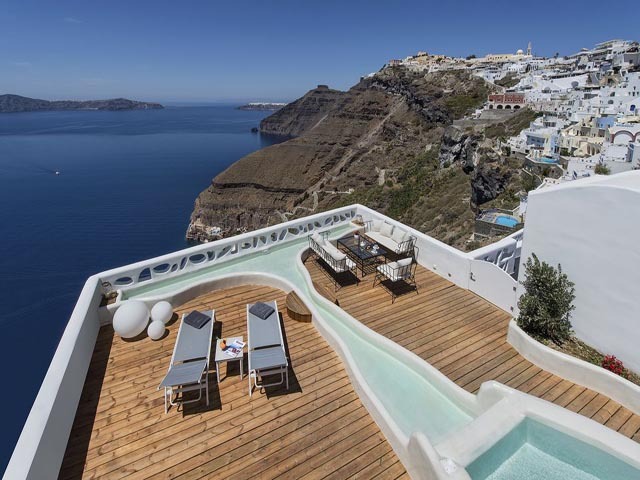 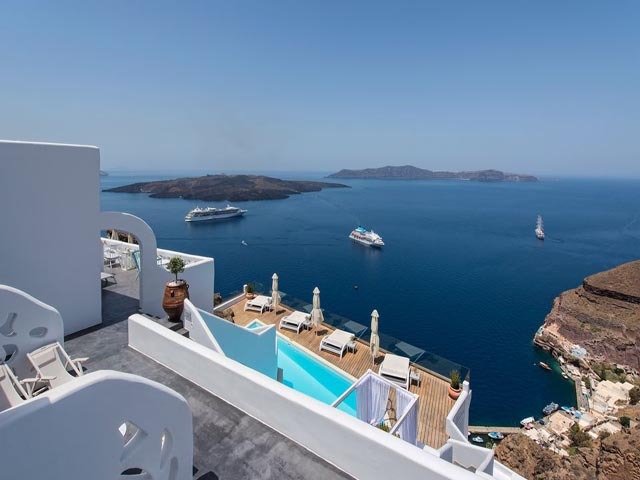 Situated at the most privileged location of Fira, on the cliffs of the caldera with unlimited views to the famous volcano, the sunset and the whole island, only a few steps away from the centre of Fira, but still with a quiet and relaxing atmosphere, Athina Luxury Suites is the place to stay in Santorini. 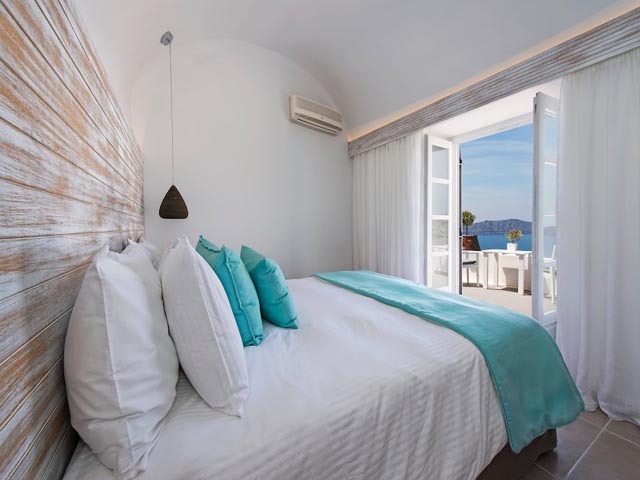 Renovated in 2016 with exclusive materials, minimal design, upgraded services and rich amenities for those who want to enjoy privacy, high class services, comfort and luxury, always with this majestic scenery from every spot of the hotel. 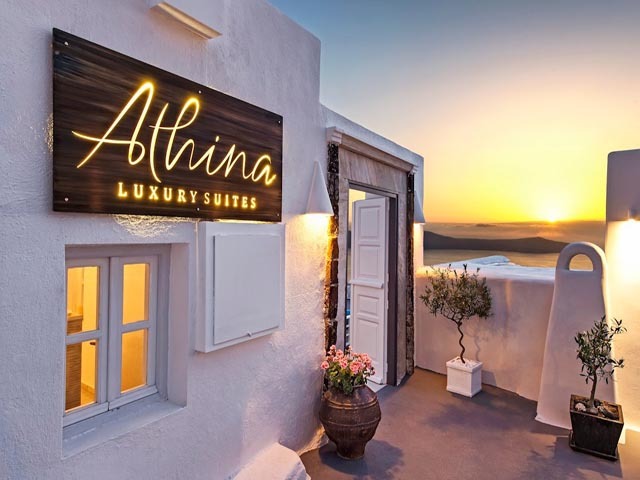 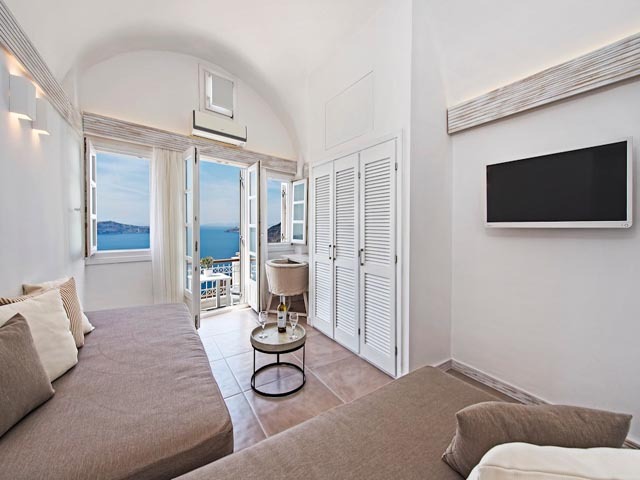 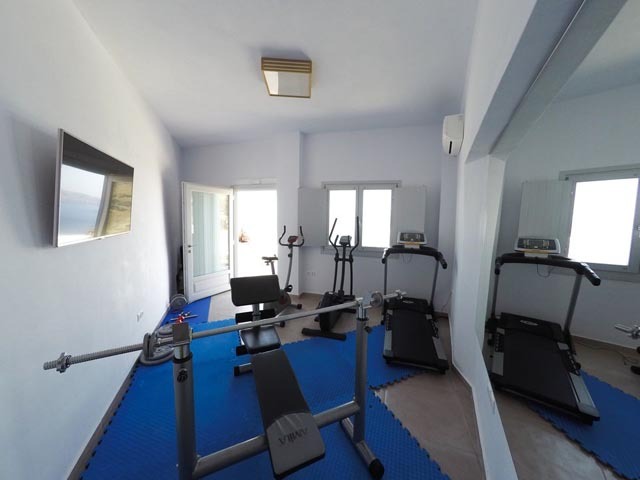 Athina Luxury Suites consists of one Junior Suite for 2 people, two Master Suites, loft style for 3 people, four Deluxe Suites with separate bedroom and living room, up to 4 people, two Honeymoon Suites, strictly for couples, with heated jacuzzis on their balconies. 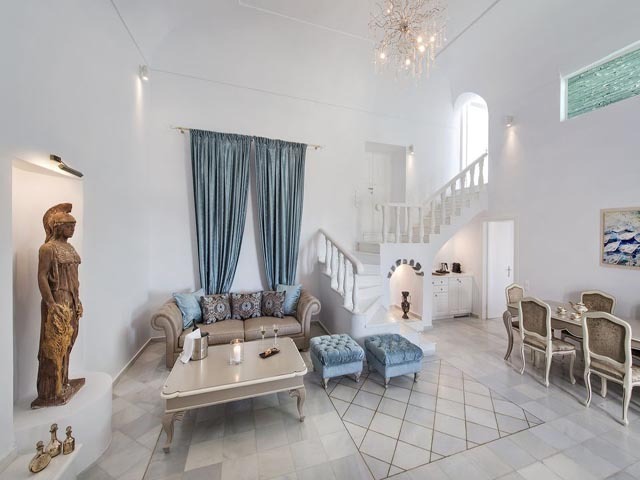 Finally, the unique Royal Suite is actually a 140 square meter villa, with a large heated jacuzzi on the private balcony, rare and precious pieces of art and furniture for up to 6 people. 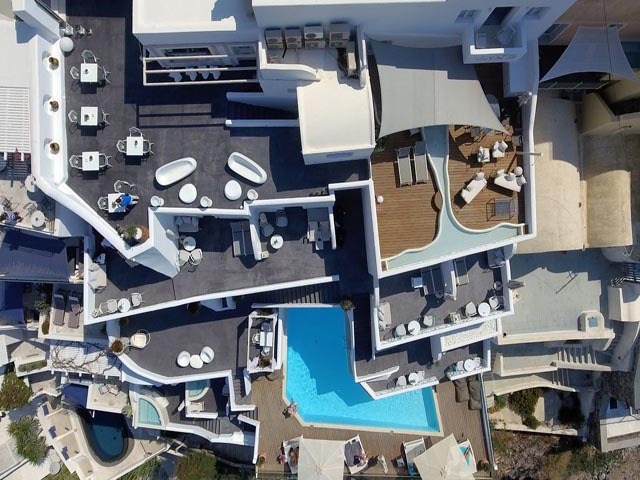 The large swimming pool offers a unique experience swimming and enjoying all the view from Oia to Akrotiri, a pool to infinity... Our coffee- bar-restaurant is open all day, with the most refreshing cocktails, serving some carefully selected dishes combined with a glass of fine wine or champagne during the sunset 'till the late hours. 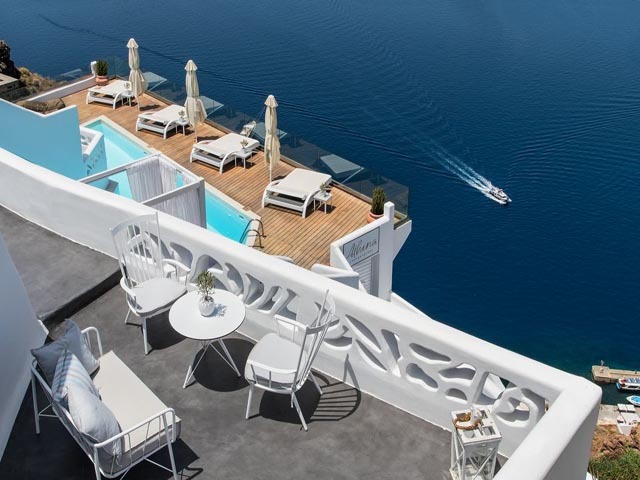 Athina Luxury Suites is also the ideal location to have your dream wedding by the pool facing this romantic scenery or just to enjoy your honeymoon in our special Honeymoon Suites. 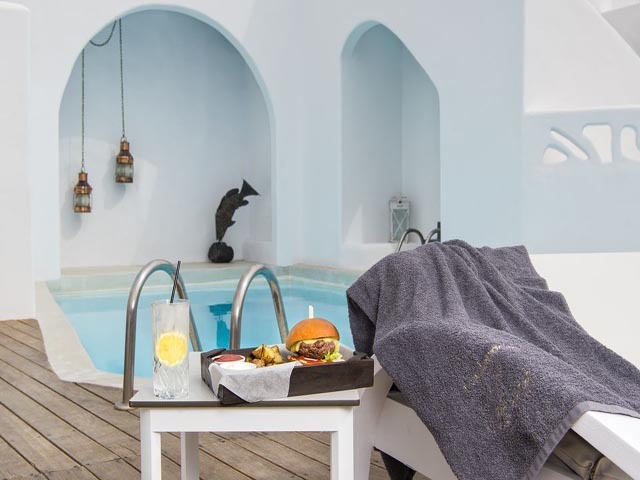 Our joy is to offer leisure and delight and to make the accommodation of every guest exclusive and unforgettable, emphasising individuality and privacy. 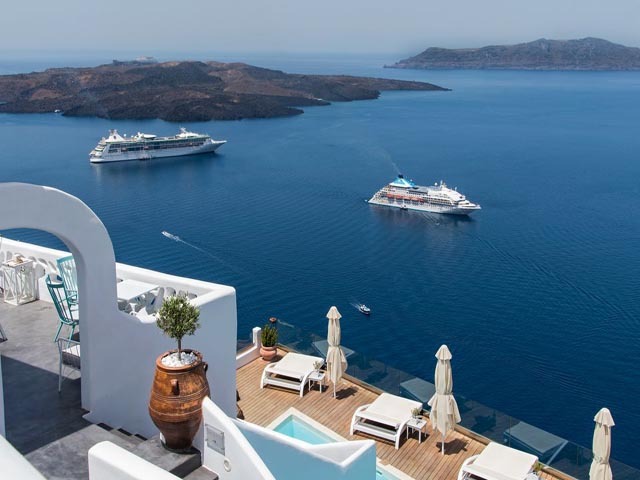 Our concierge desk is always open, to every demand and request, arranging from VIP excursions, transfers, car rentals, yacht rentals, helicopter rides, private dinners and every other need or request a guest may ask. 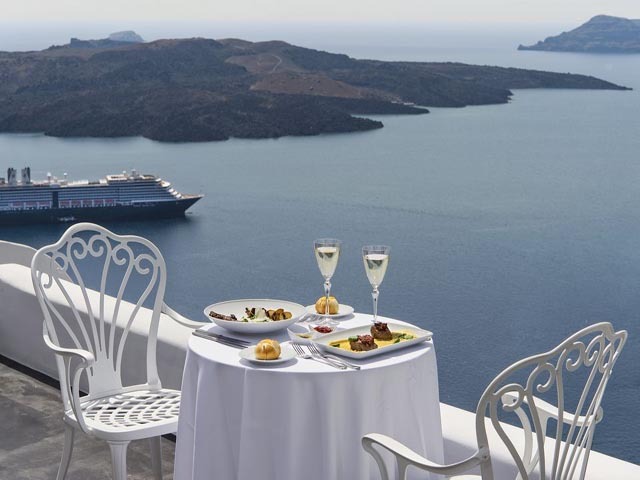 Our private balcony is ideal for intimate dinners overlooking the volcano. 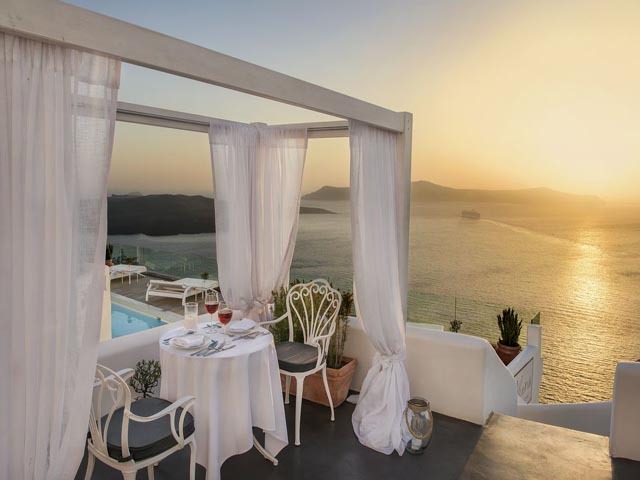 Set with fresh flowers, candles and romantic decorations this meal will be the most memorable of your adventures in Santorini. 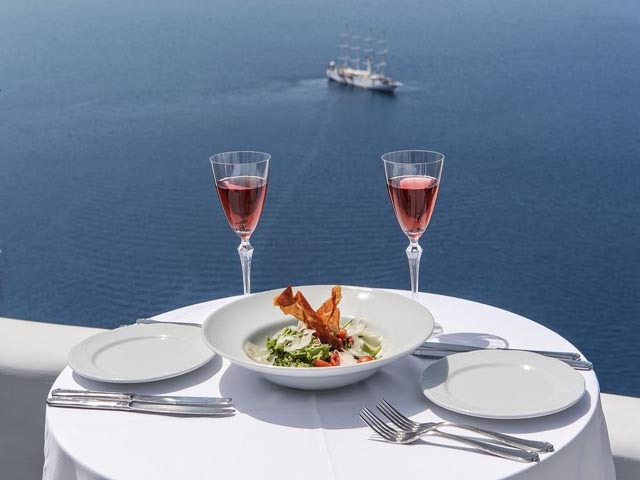 Enjoy a glass of champagne whilst drinking in the colours of the sunset.After the sunset indulge in a private dinner, where your personal waiter will cater to your every need and whim. 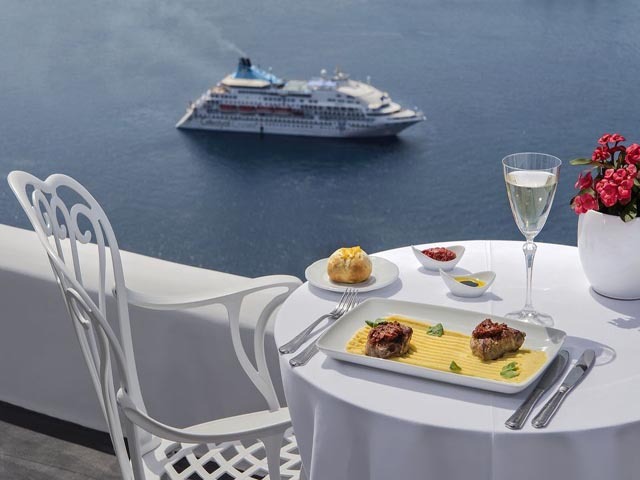 After your meal, enjoy a decadent desert served to you personally by our chef. 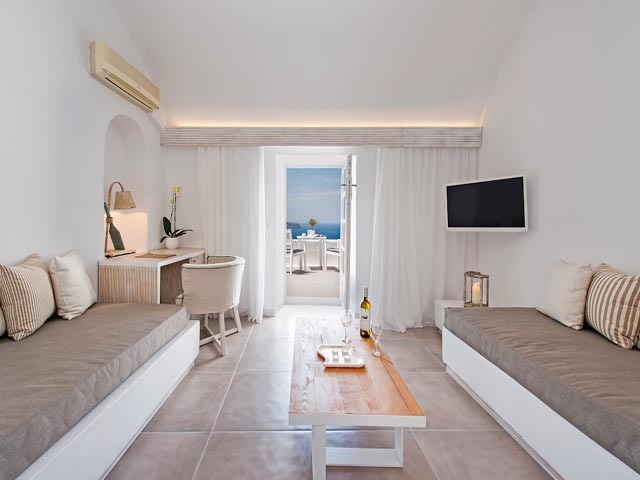 Athina Luxury Suites consists of one Junior Suite for two people, two Master Suites, loft styled, for up to three people, four Deluxe Suites with separate bedroom and living room, for up to four people, two Honeymoon Suites, strictly for couples, all with their balconies in front facing the amazing view. 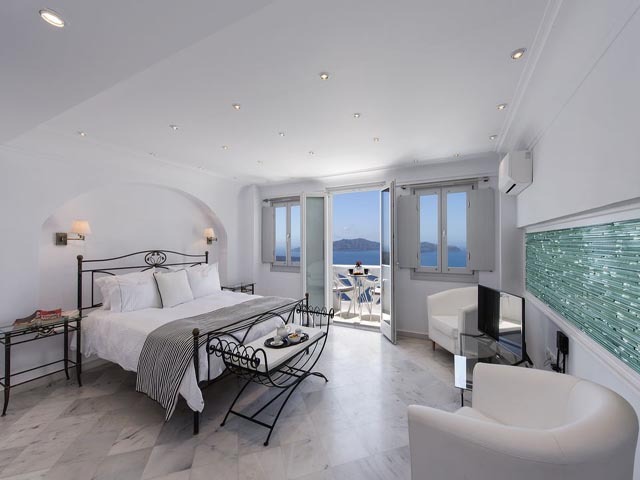 Finally, the unique Royal Suite is actually a 140 square meter villa, with a fantastic private balcony with a large heated jacuzzi, rare and precious pieces of art, and can accommodate up to six people. 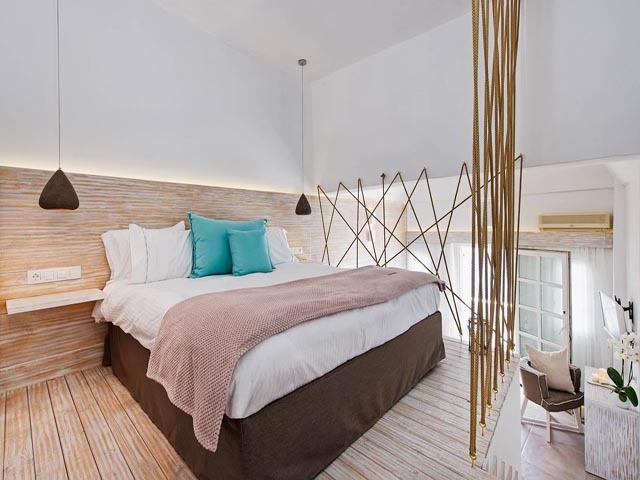 Our Junior Suite with minimal and luxurious design, can accommodate up to 2 people, with a double bed and all the luxurious amenities and services. 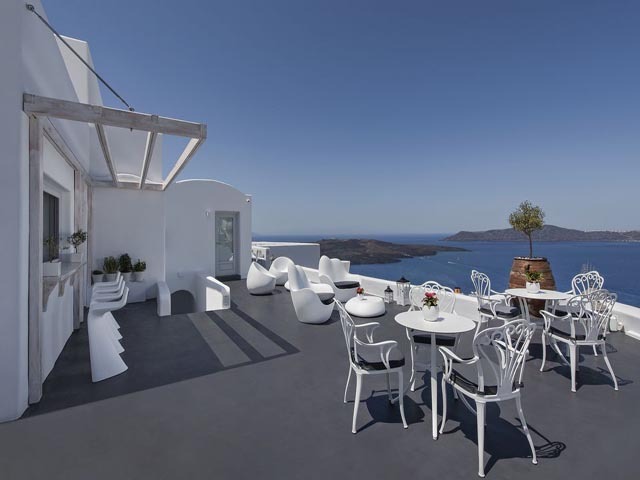 It has a balcony with unlimited view to the famous volcano, sunset and the whole caldera. 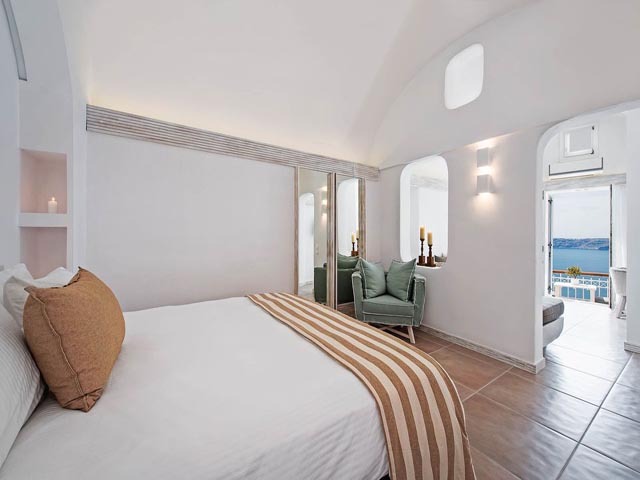 Modern loft styled rooms with a double bed and a sofa bed, can accommodate up to 3 people. 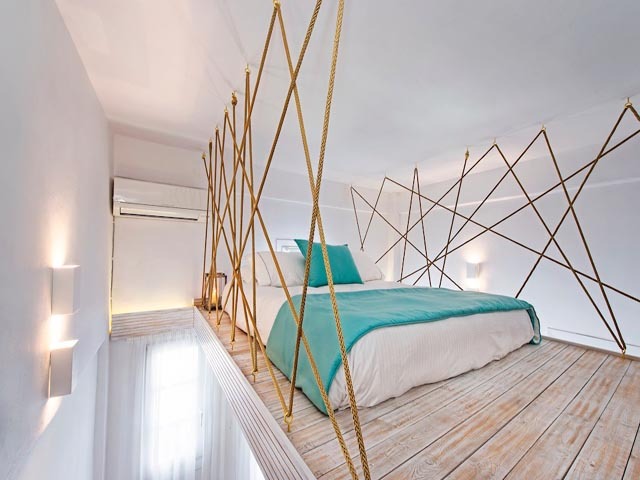 Exclusive design with fresh materials all over the place. 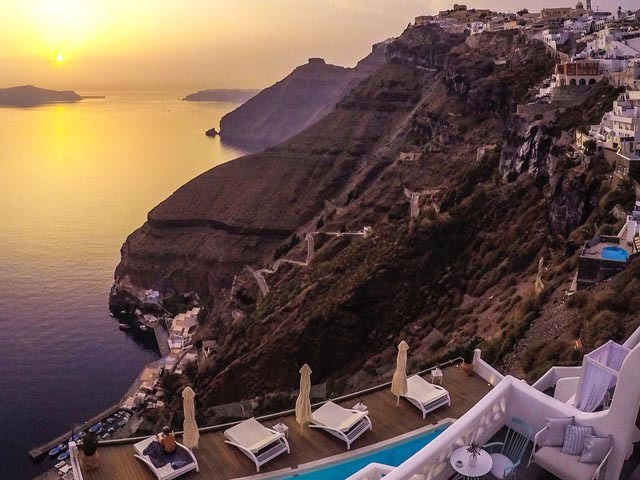 The balconies have all the view to the volcano, the sunset and the whole caldera. 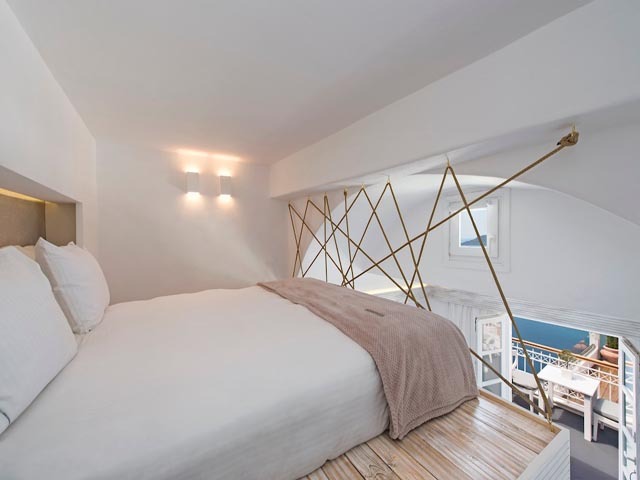 Comfortable 2 spaced rooms, with king size double beds and separate sitting area with comfortable sofa beds, can accommodateup to 4 people. 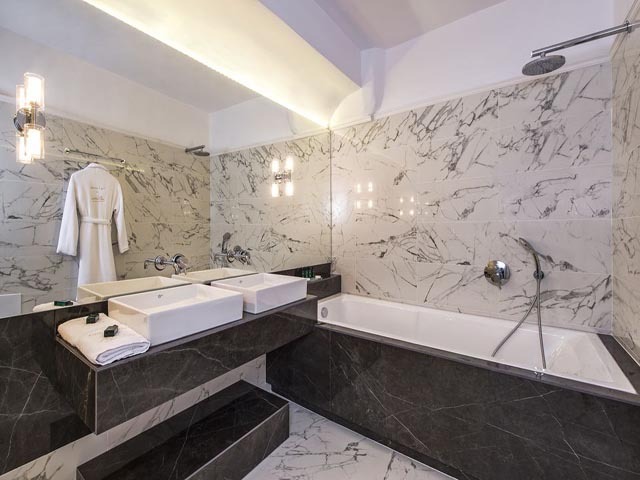 The minimal and luxurious style meets coziness with all the high class services and amenities of our hotel. 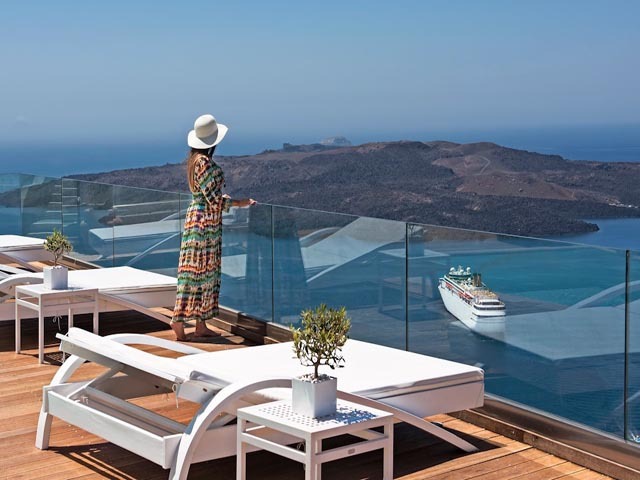 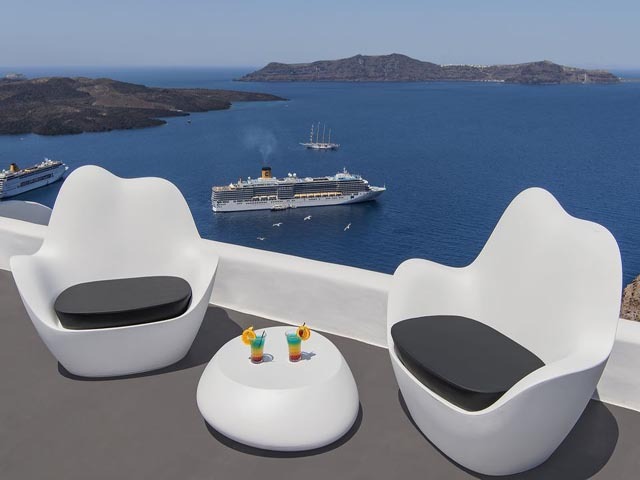 The balcony of each Deluxe Suite has unlimited view to the famous volcano, the sunset and the whole caldera. 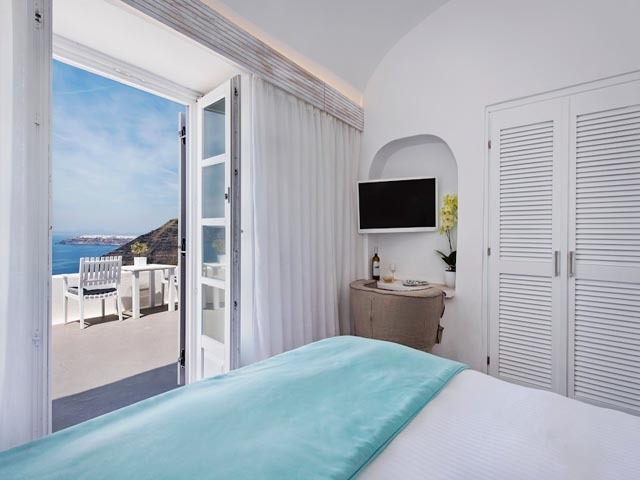 Our unique Honeymoon Suites can make your private moments unforgettable! 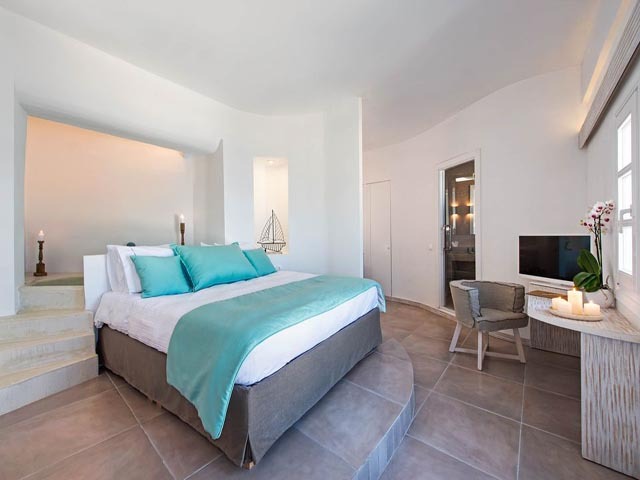 With a separate sitting area, king size double bed, jacuzzi in the room with view to the volcano and all the high services and amenities of our hotel. 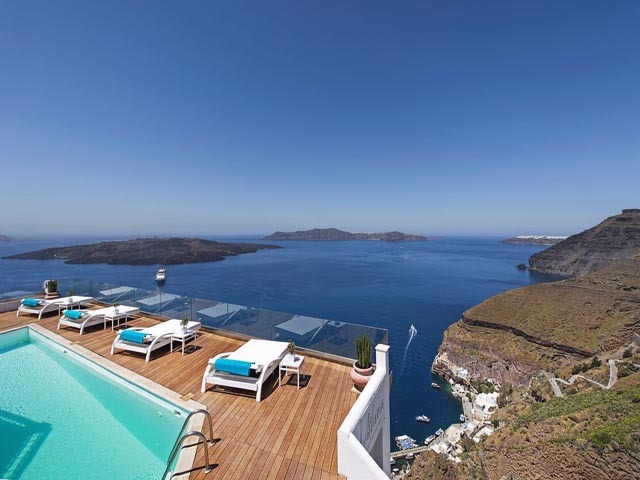 The balcony of each Honeymoon Suite is almost private with all the unlimited view for your eyes only. 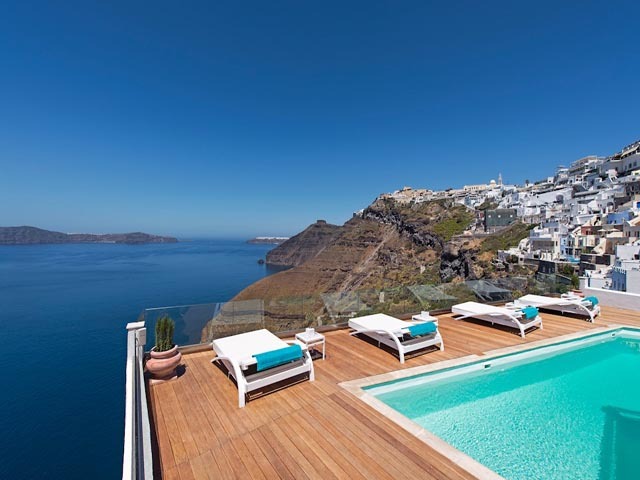 Strictly for couples. 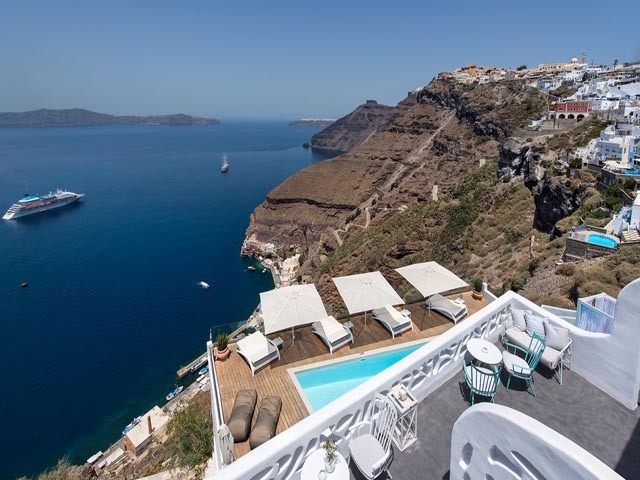 One of the most exclusive and private places to stay at the cliffs of caldera...our Royal Suite consists of 2 Master bedrooms with private bathrooms, a large living room with rare and sophisticated pieces of art where a comfortable double sofa bed can accommodate 2 more people with their own bathroom. 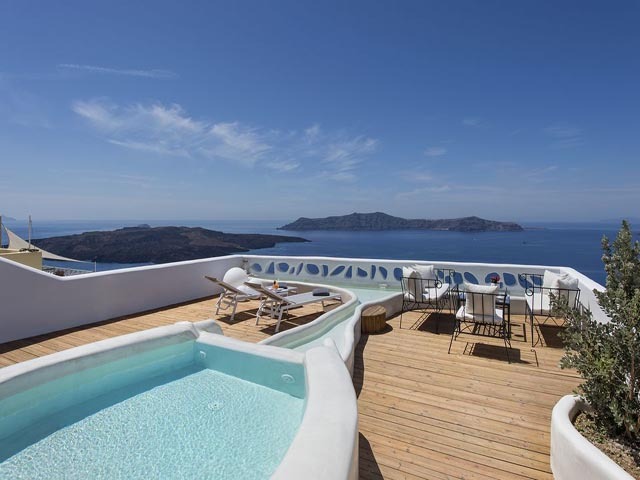 The "jewel" of this suite is the large, almost 60 square meters private balcony, with outdoor large pool-like private jacuzzi, sun beds and dinning table, offering privacy and unlimited view to the famous volcano, the sunset, the caldera and the whole island in front of your eyes! 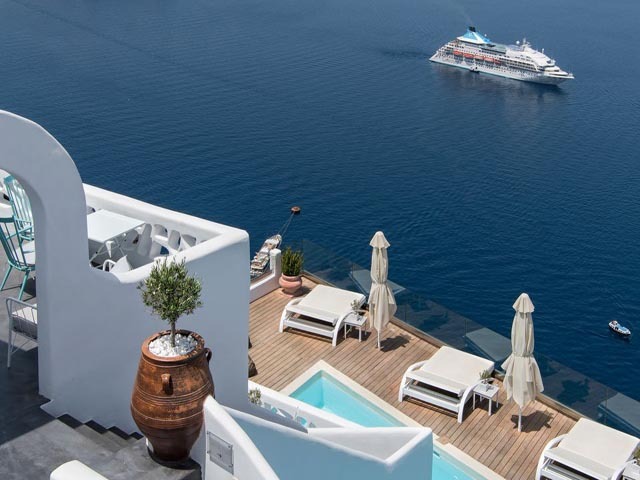 VIP services are available on request. 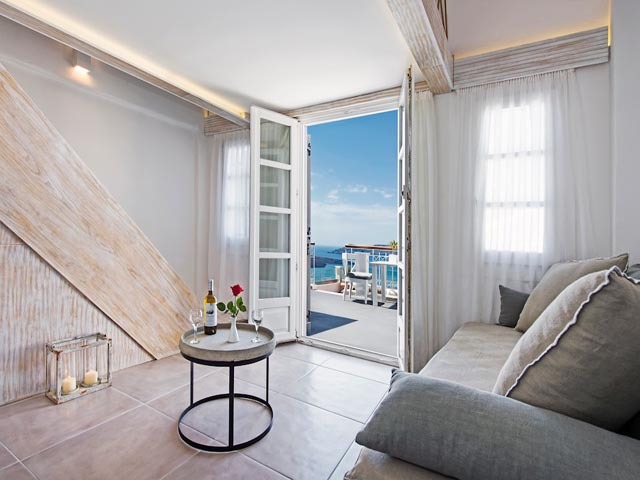 Open All Year ... Renovated in 2016 with exclusive materials, minimal design, upgraded services and rich amenities for those who want to enjoy privacy, high class services, comfort and luxury, always with this majestic scenery from every spot of the hotel.